While I was keen to go for a walk today, I was not keen to drive far. 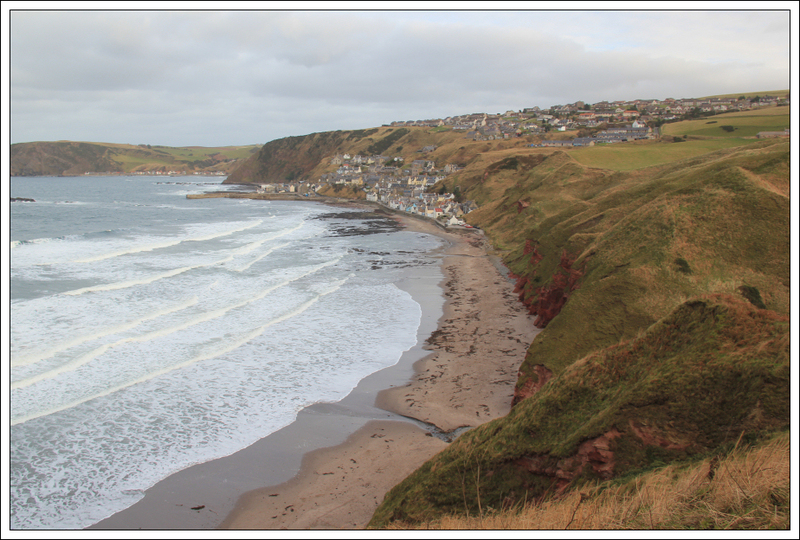 Therefore, instead of undertaking a >2 hour drive to ascend a new hill, I decided to undertake a 15 minute drive to walk a new section of coast. 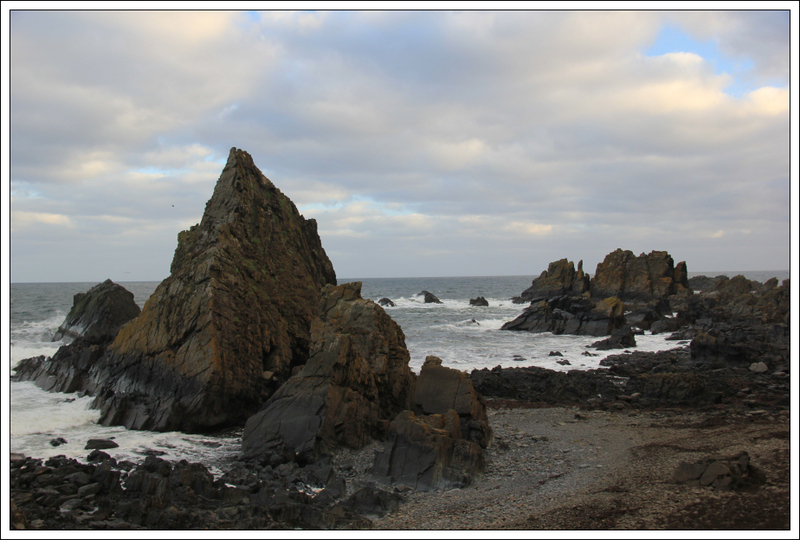 Having previously walked the Moray Coast from Macduff to Spey Bay, my next section of local coast would be either Spey Bay to Lossiemouth or Macduff to Gardenstown. 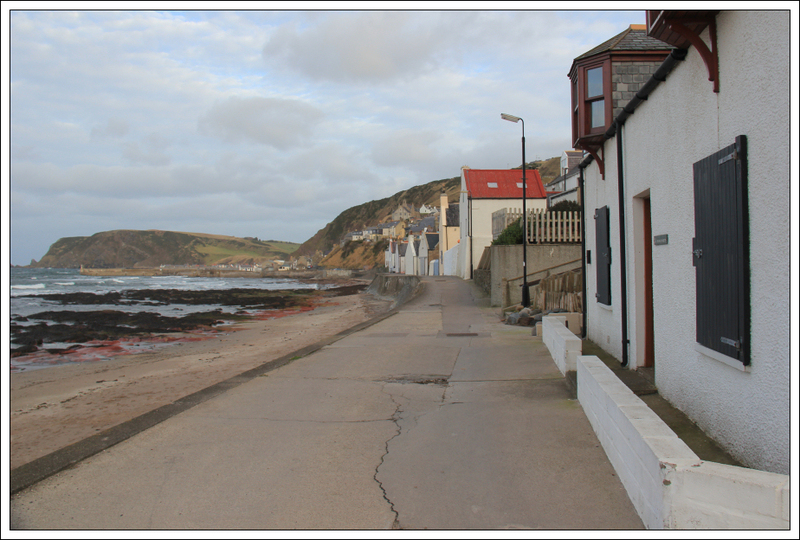 I opted to walk from Macduff to Gardenstown (known locally as Gamrie). 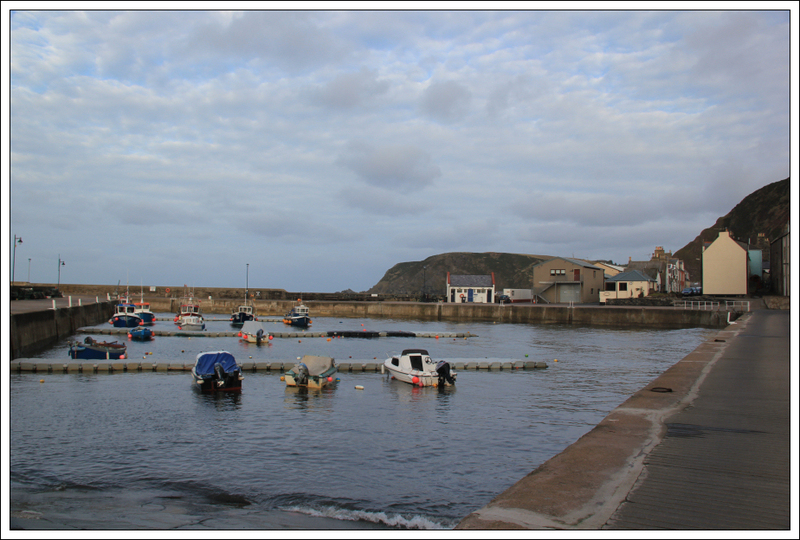 I parked and set off walking from the Macduff Marine Aquarium car park. 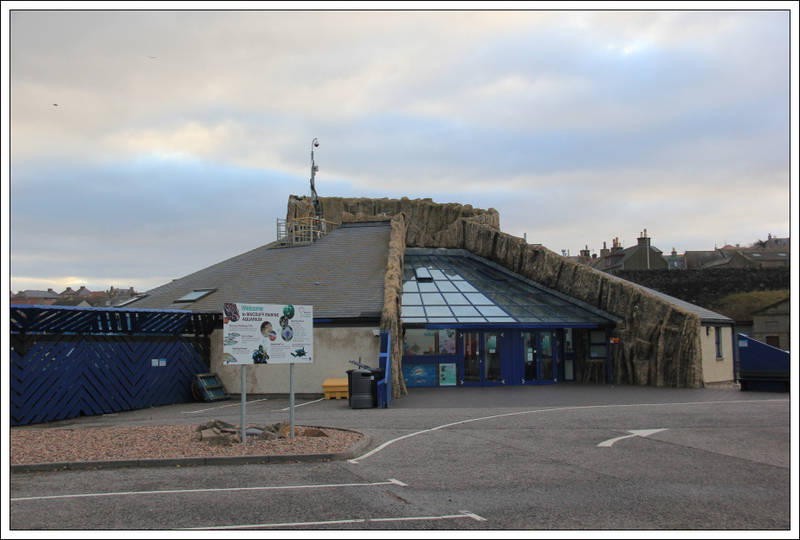 If you are ever in the area, the Macduff Marine Aquarium is worth a visit. 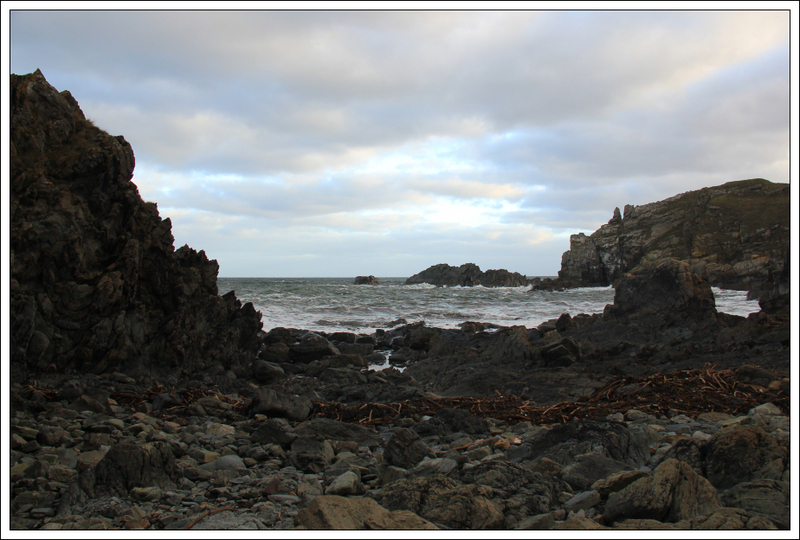 As per all of my previous coastal walks, I tried to walk as close to the shore as possible. 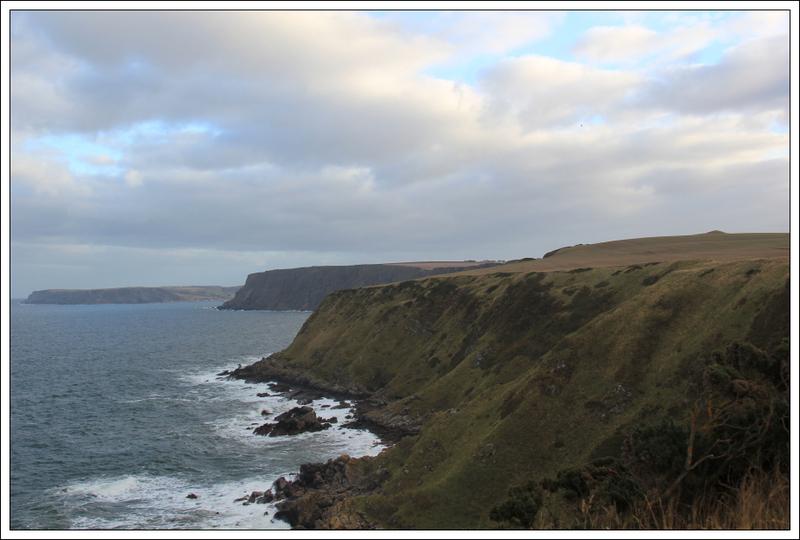 Coastal paths that take you along nearby roads are not in my view coastal paths! 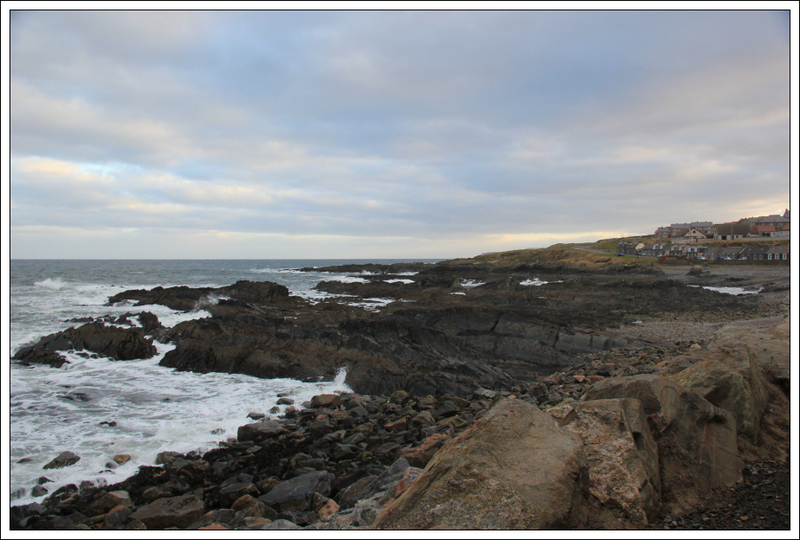 After walking behind the aquarium, I walked along the coast at High Shore, Macduff. I then followed a faint path along the shore-side of a wire fence. At one point I had to climb over the fence to avoid some subsidence. This faint path skirted around the Wastewater Treatment Plant at Berrymuir. 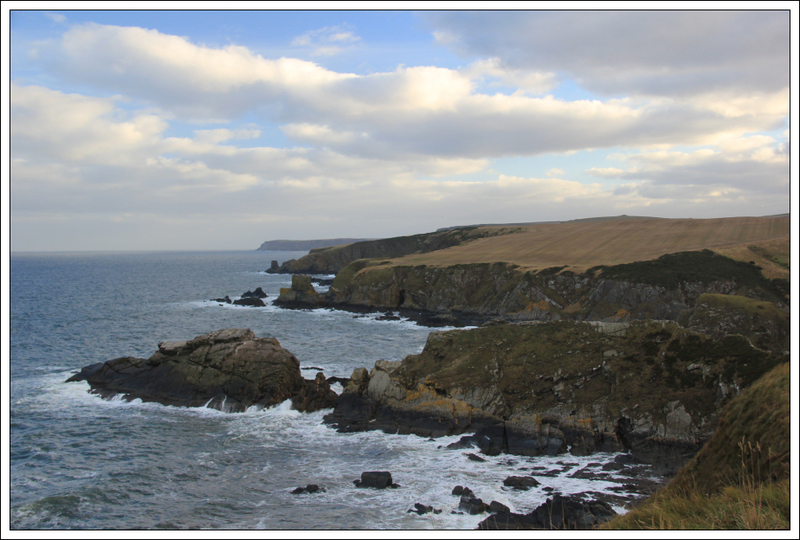 The coastline became more interesting as I approached Tarlair. 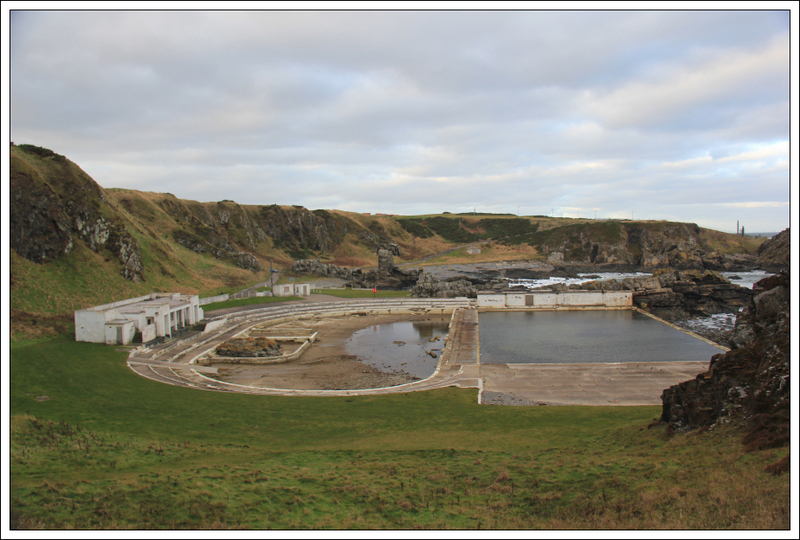 At Tarlair there is the remains of an Art Deco swimming pool that was built in 1931. 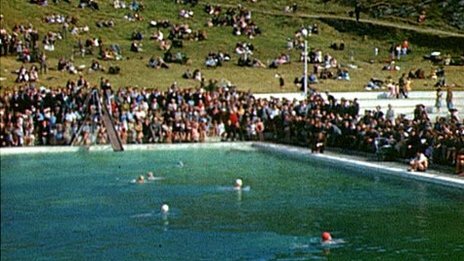 This is a Category A listed building and is, according to Historic Scotland, the best surviving example of an outdoor swimming pool in Scotland. 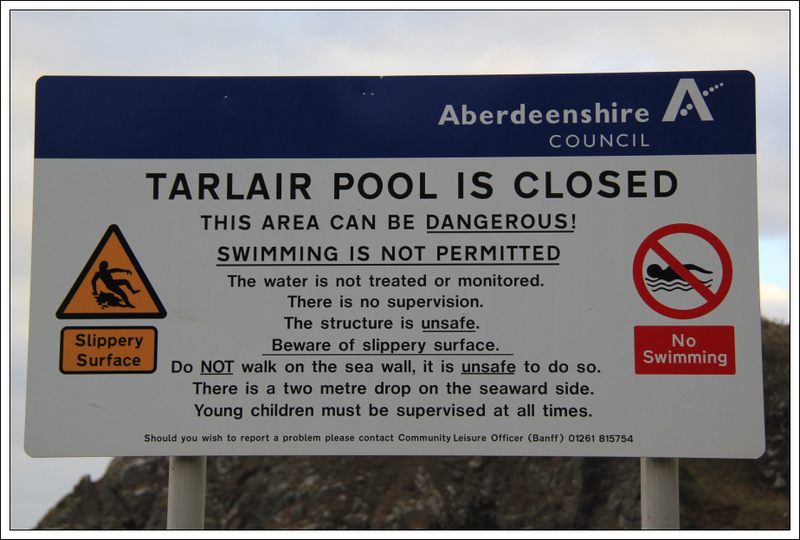 Aberdeenshire Council has recently agreed to fund £300,000 of essential improvements/repairs. 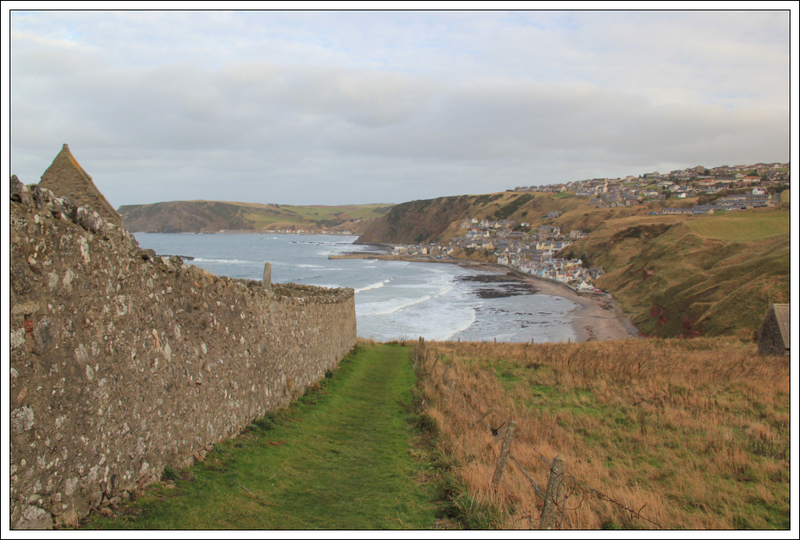 Beyond Tarlair Pool, I ascended a grassy slope leading onto Royal Tarlair Golf Course. 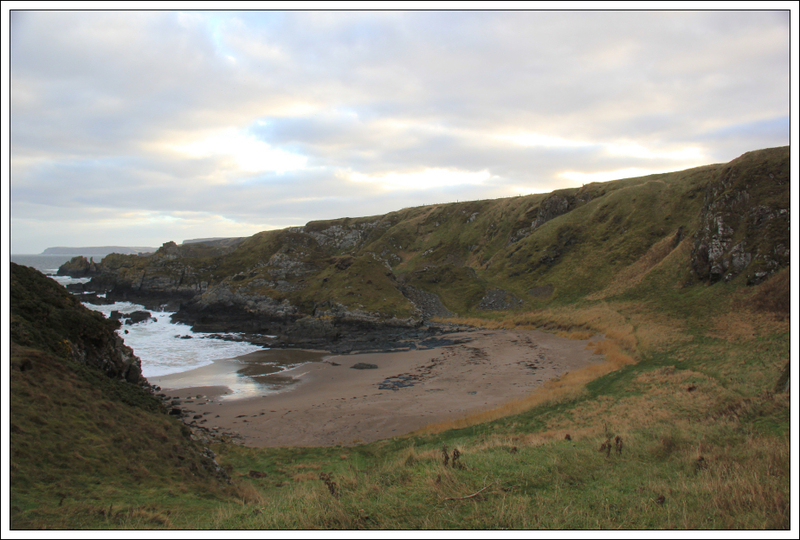 Once on the golf course I skirted round Hole 13 before descending to the beach at Shore of Cullen. 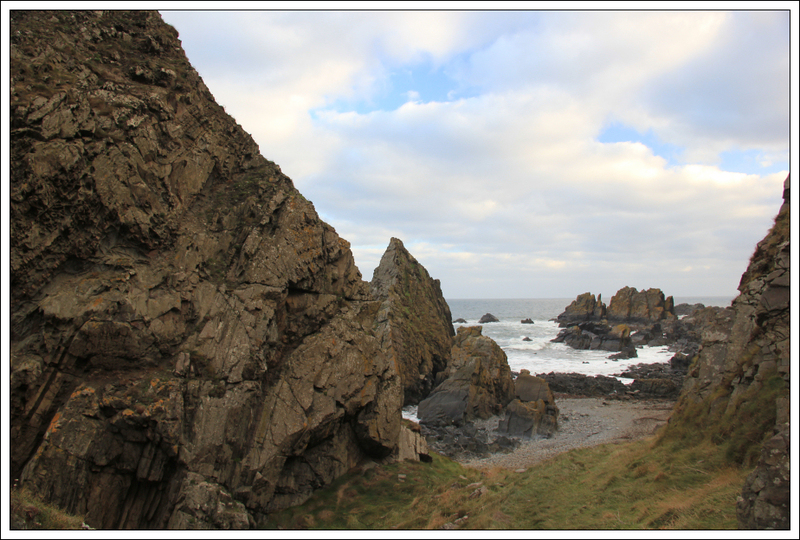 Beyond the beach at Shore of Cullen is Tarlair Crags – a rock climbing venue with numerous fins of rock jutting out into the sea. Despite being so close-to-home, I have not previously climbed here. 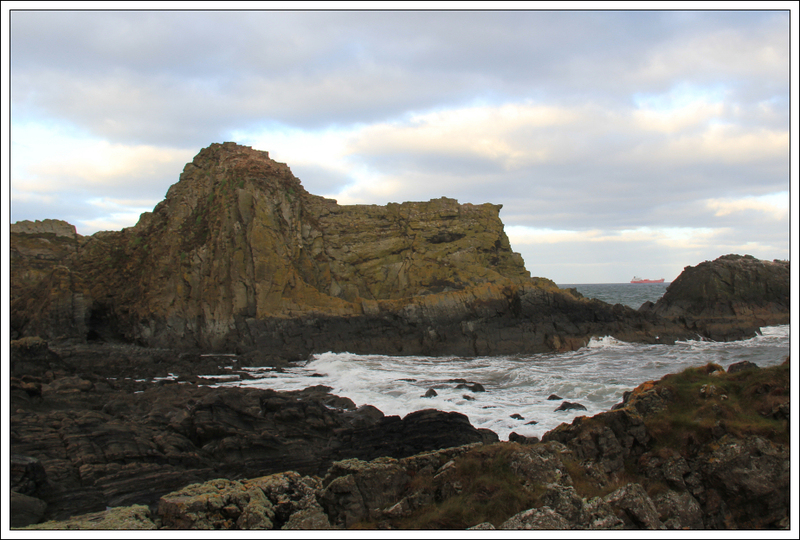 From reviewing the North-East Outcrops guidebook, I think the steep vertical wall in the next photo is the Black Tower. 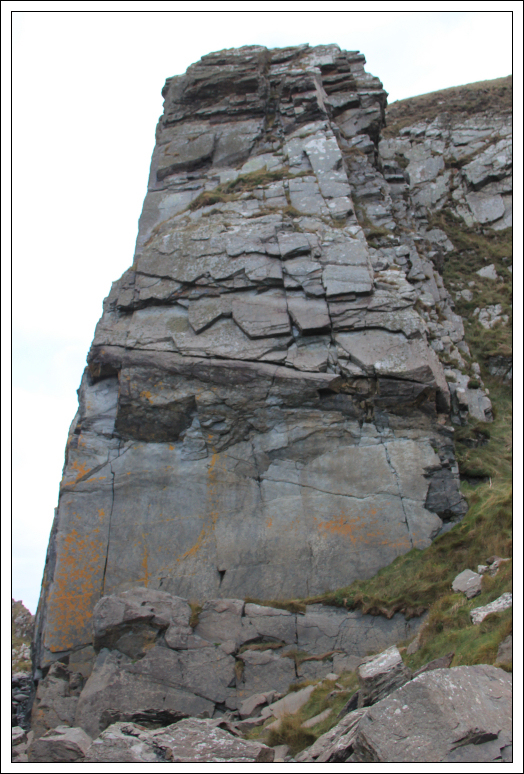 There are apparently three routes on this wall but only one graded in the guidebook – The White Heart 45m E2. 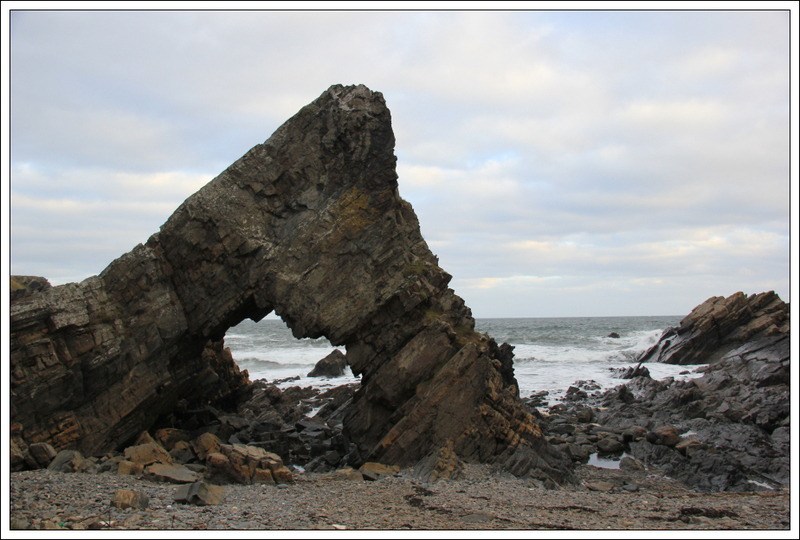 My guess is that the rock in the next photo is “The Molar” which has seven routes listed in the guidebook ranging from Diff to E5! 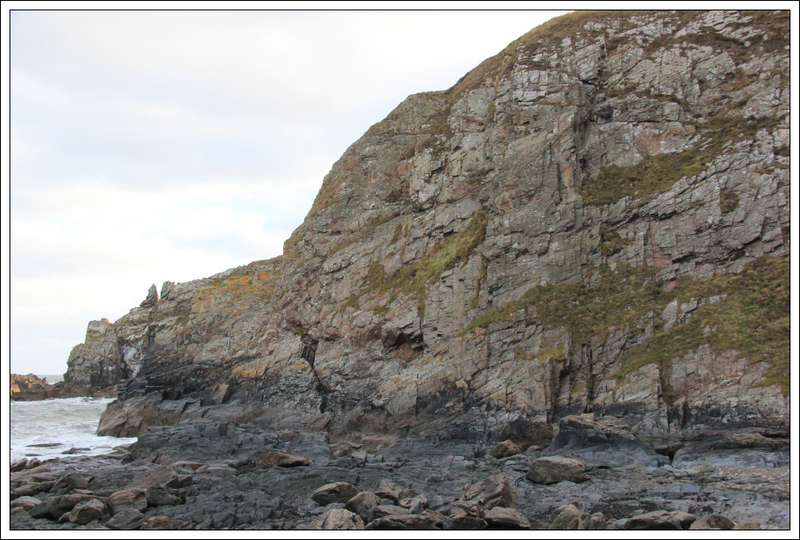 I wouldn’t mind revisiting these crags to do some of the easier climbs. 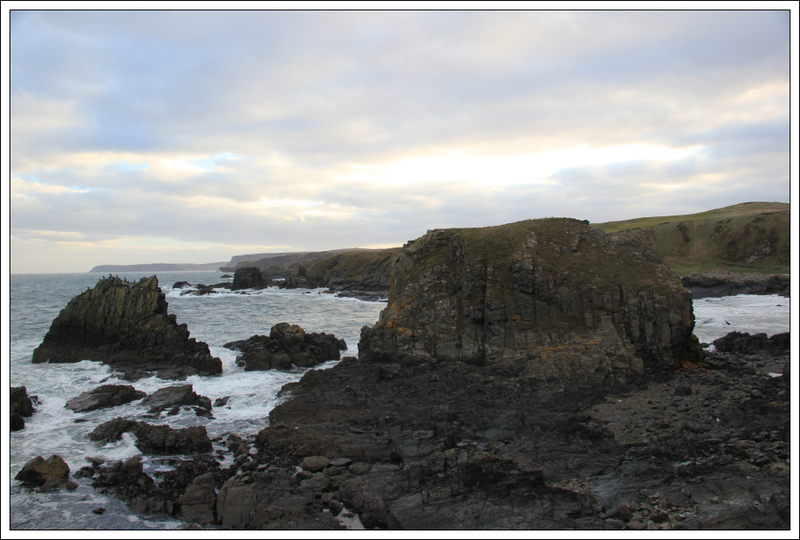 Visiting Tarlair pool and crags was definitely my favourite part of this walk. 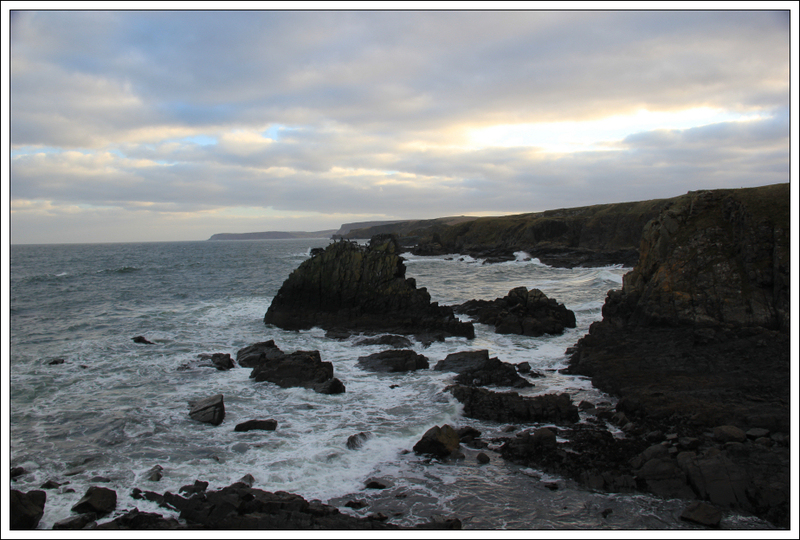 Beyond Tarlair Crags, I continued along the shore until I could continue no further. 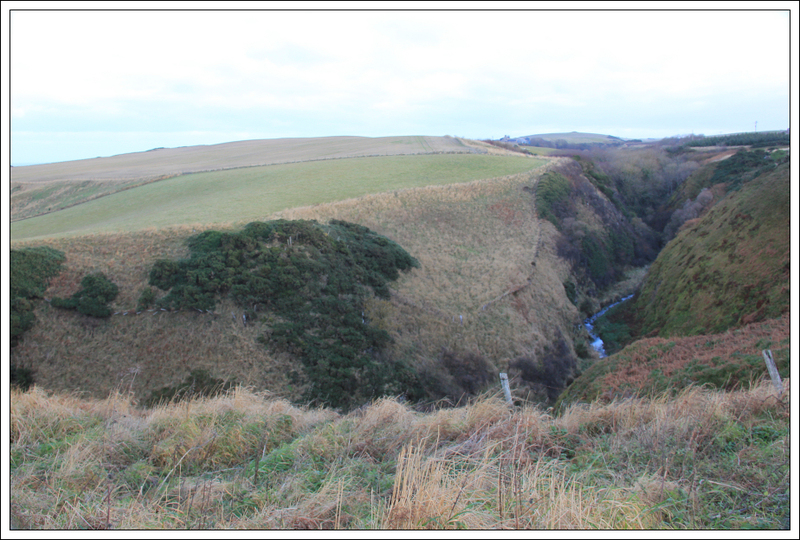 On reaching a cliff with the sea at the bottom, I ascended a steep grass gully to enter a field at the top of the cliffs. There is a barbed-wire fence to climb over at the top. 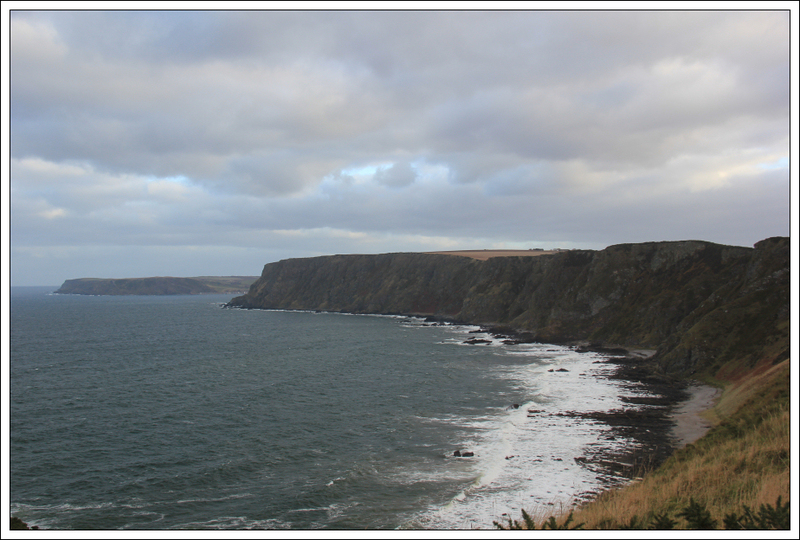 While it was great to walk along the shore, it was also nice to walk along the cliff top. 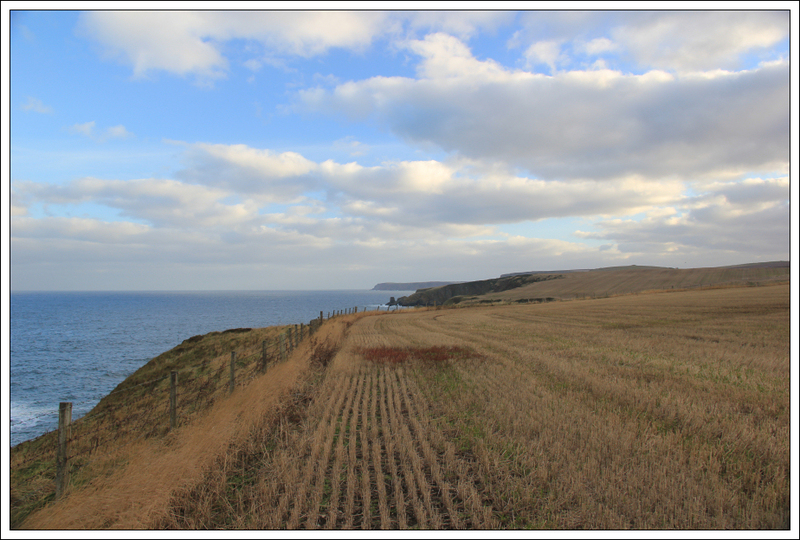 The walk along the cliff tops towards Gardenstown involved walking through numerous fields and climbing over numerous barbed-wire fences. Near Mill of Melrose there are a couple of steep drops and lots of barbed-wire. At this section I had to skirt right round the field returning briefly to the road to bypass the steep drops. 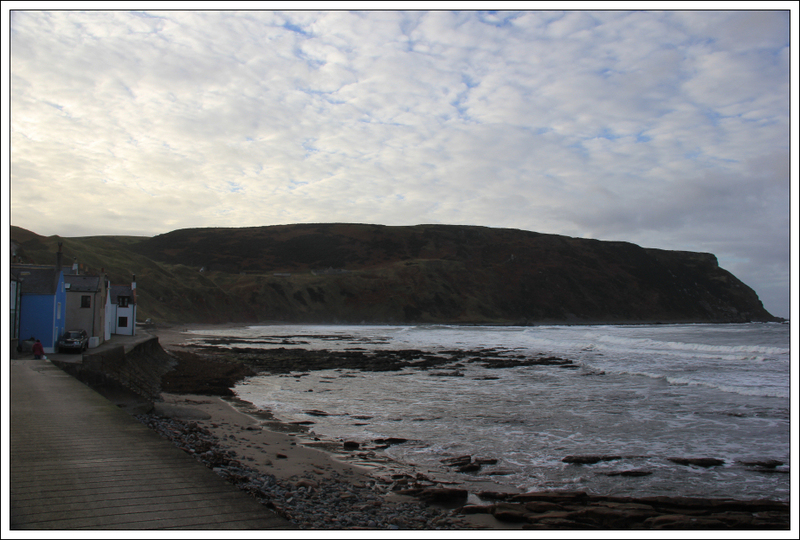 The “coastal path” suggests walking along the road for most of this walk. I walked along the road for 100-200m at the most. 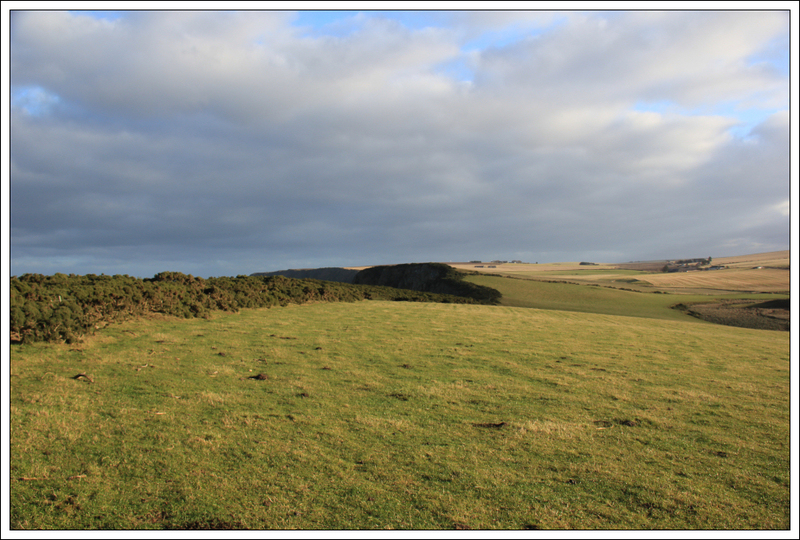 Once past the steep drops, I crossed another field to get back to the cliff top. 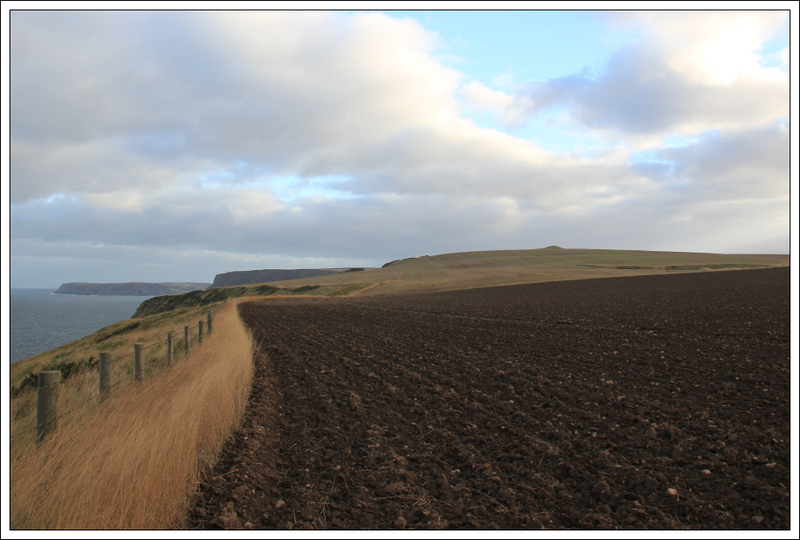 Walking along the edge of ploughed fields was quite hard work. There is no option but to stay high along this section of coast, unless you have a boat. 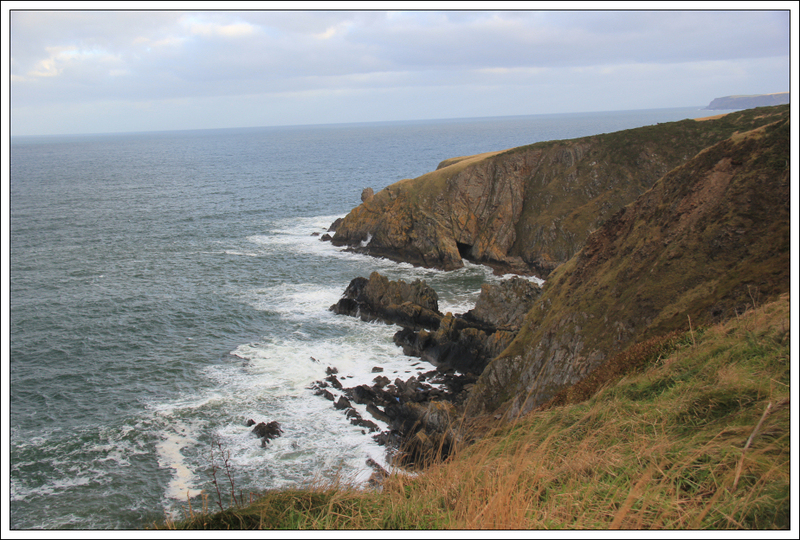 The cliffs at More Head are fairly steep and continuous. 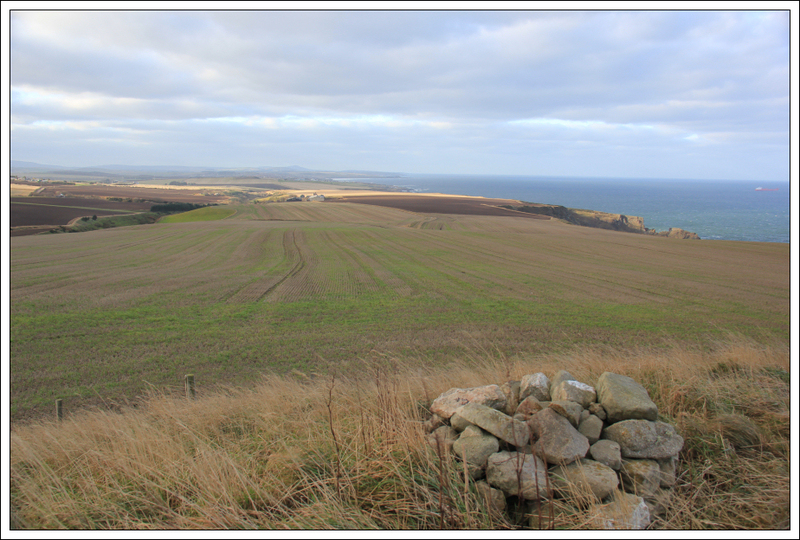 As I approached Stocked Head, I took a small diversion to ascend the 123m cairn marked on the map. 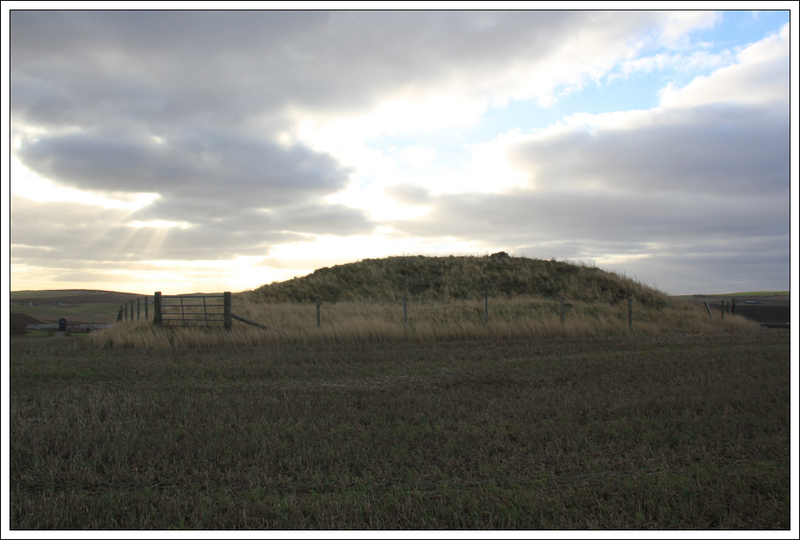 There is a new cairn situated on top of the much larger grass-covered cairn. I wonder how old this cairn is? I next had to enter a field of grass. This was easier said than done as the barbed-wire fencing was somewhat problematic. 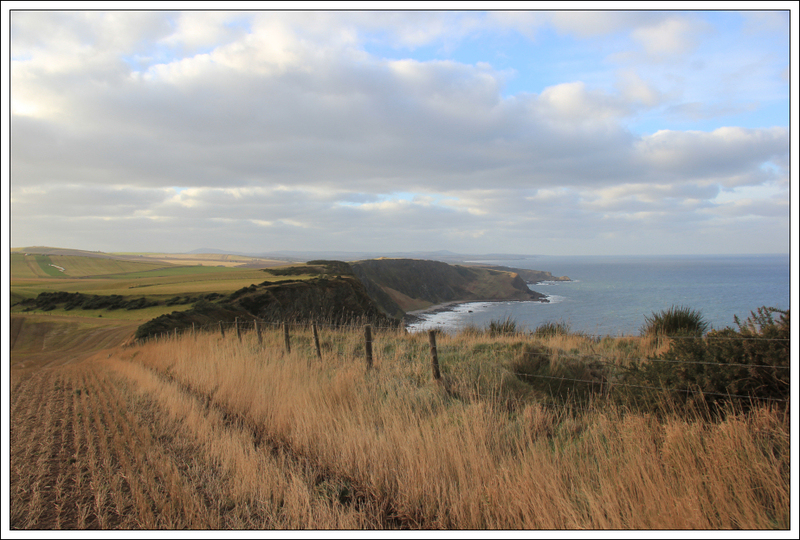 After eventually finding a way over, I spotted cattle at the far end of this field – hence the excessive barbed-wire to prevent them going over the cliffs. On reaching the other end of this field there was more awkward barbed-wire to negotiate. Once over this fence, I was surprised to meet three walkers who were doing the same walk in the opposite direction. It was nice to stop for a brief chat. I was really pleased at one point to get from one field into another without having to climb over yet another fence. This walk was further than expected, involved much more height gain than expected and took longer than expected. 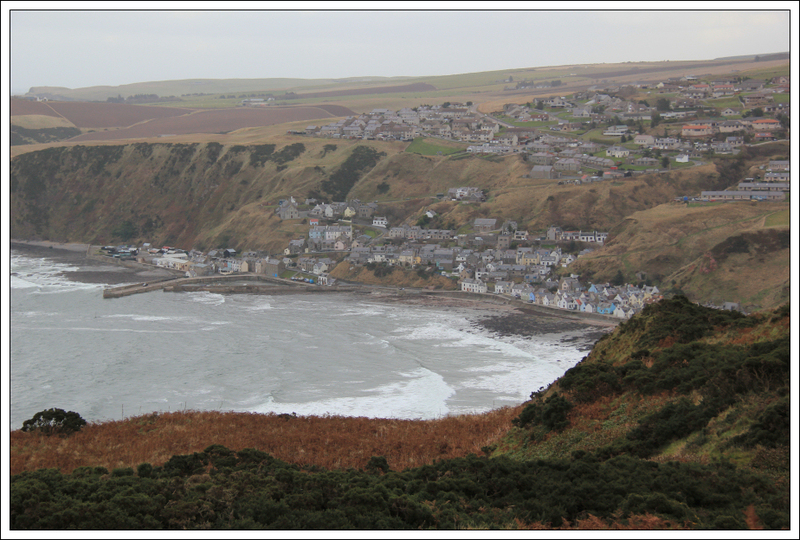 It was good to eventually see Gardenstown below. Now all I had to do was find a way back down to sea level. I noticed a path marked on the map but could not find it on the ground. Instead I forced my way through circa 100m of waist-high bracken and then climbed over yet another barbed-wire fence to reach a track leading to St. John’s Church. 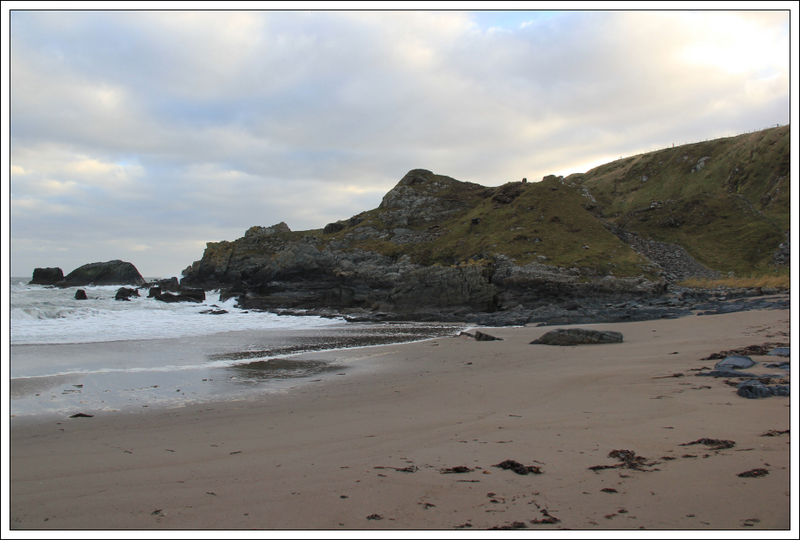 From St. John’s Church, I followed a good track leading down to the beach. 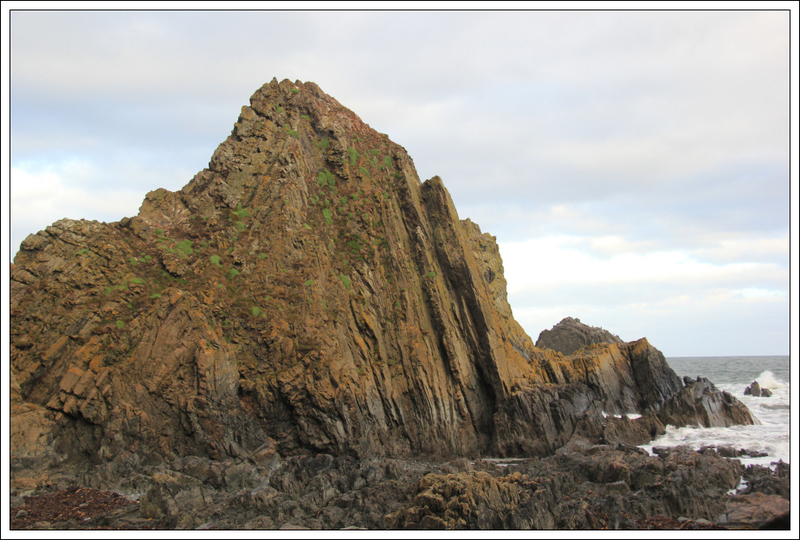 The rock next to the beach is very dark red sandstone. 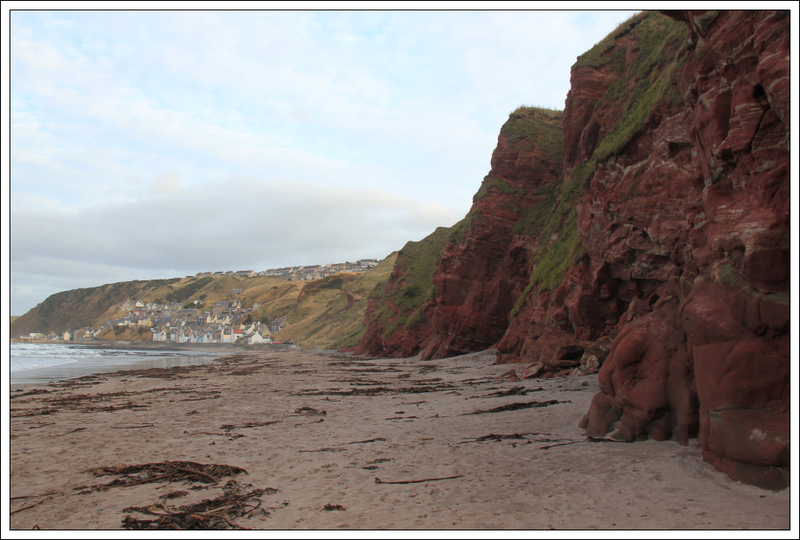 I can’t recall seeing such a dark red sandstone anywhere else in Scotland. I really enjoyed this walk apart from having to climb circa eight barbed-wire fences. Thanks to John and Linda for picking me up in Gardenstown .